If I had a penny for every time I've been asked if email marketing works, well I'd have a lot of pennies. Of course, book publishers have come late to the email marketing party - every other industry has been there for years. Happily converting prospects to buyers of pretty much every B2B and consumer product and service. The world's largest and most successful companies still rely on their email database - hello Amazon's 4+ emails per day (spoiler - they all convert to sales), Netflix, Twitter, LinkedIn - social media platforms they may be, but it's good old-fashioned email that guarantees them return visitors. 2. We don't want to spam our database - once a month is PLENTY. 2. If you are sending them less frequently than once a month, don't bother. If you aren't measuring if they actually work, ditto. If people unsubscribe, it's OK, you don't want them on your list. I met a publisher who sent 2 emails per year to their list (people die in between these emails). Frequency is key, get your audience familiar with your emails and if you're really good, they might even learn to expect them). Ok, we've got that out of the way. 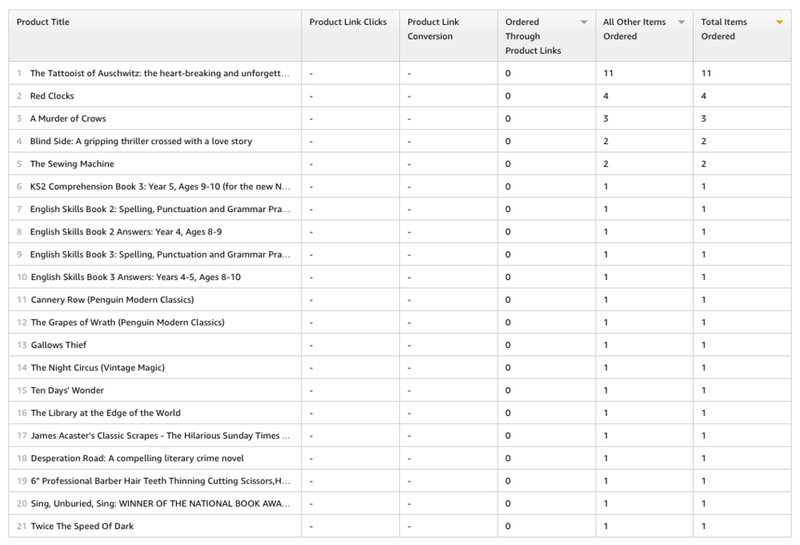 Here is what can be achieved marketing to a very modest list of 3200 on my Lounge Books newsletter. I sent this email on Tuesday 6th March at 2.24pm, UK time. (Note: BookBub and a lot of the other ebook deals newsletter arrive at this time every day - and I am very confident they've tested timings). This is very much a sales email:- here's the book, the blurb, the offer, BUY NOW. Emails can do many things - direct folk to author events, pages across your website, your blog posts, encourage reviews, the list goes on. But, if you want people to buy your books, then you need to remove as many of these distractions as possible and encourage people to BUY. I do recommend authors and publishers send newsletters that have different objectives, but you should certainly send sales emails. (Here's a list of newsletters to sign up to - with specific reference to PenguinRandomHouse's newsletter - LEAGUES above all other publishers). So, the Lounge Books deals email was sent out to 3200 people on my email list. Using Mailchimp campaign reporting, this is how my email performed in terms of open & click through rates. These are the links on the email which were clicked - so you an see which books were clicked most. 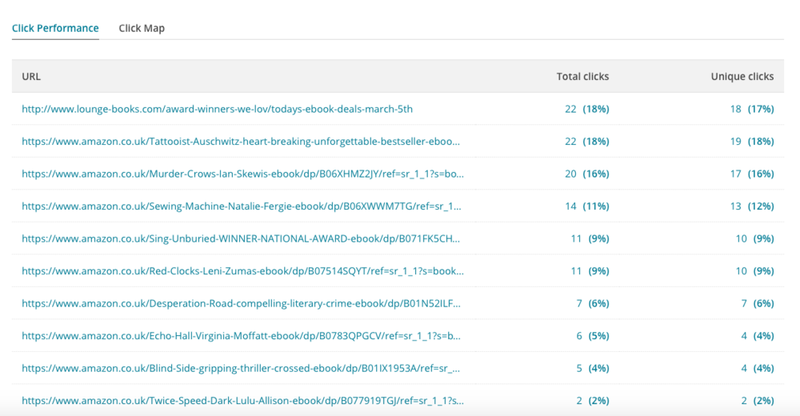 This is the click map for the email (for the top 3 books) - what % clicked on the books and the BUY NOW buttons. I have set up Amazon affiliates, so I can measure what happens after they click on my email. This is what it looks like in terms of how many books were sold. Note: there are book sales on here for books that don't appear in my email, that's because folks have landed on Amazon thanks to my email and then browsed and bought other books. All good. Email sent to 3198 >> Opened by 1058 >> Unique people who clicked 79 >> Number of clicks 126 >> Number of sales 38. As you can see I'm not going to make any of these authors bestsellers any time soon. But this activity is almost entirely scalable. If a publisher had 10,000 on their list, they'd sell 119 books, 100,000 they'd sell 1,188. And don't forget this is one email on one day. If you sent one per week, you'd sell 475 books per month (off a 10,000 list) or 4752 books per month (off a 100,000 list). When you start looking at numbers over the year, you've got a VERY nice and reliable sales channel. - Divert some of your marketing people resource and budgets away from your campaigns and into a proper email marketing strategy (mid to long-term you'll sell more books, have a reliable sales channel, sell more backlist etc etc). - Stop sending imprint newsletters - nobody cares & they don't work (Sorry). Extremely inefficient use of your imprint marketing teams. Instead, pool your email list and send newsletters to genre segments instead. AND encourage your authors to set up their own newsletters or run them for your brand authors (properly). YOUR AUTHORS ARE YOUR BRANDS, NOT YOUR IMPRINTS. (Note, the UPPER CASE). - Include at least 2 (preferably 4 or 5) email capture opportunities during every single book marketing campaign. 'Enter your email to be the first to hear about blah blah', 'Enter for a chance to win tea with author X', 'Enter for a chance to win a VIP ticket to see author X at venue and meet her afterwards', 'We have 50 exclusive hardback copies of X, enter to win one', the list goes on. - Use the ads in the back of your books to drive to email newsletter sign up (with an incentive). - Set up a deals email IMMEDIATELY (see if your authors will help encourage sign up from their readers). 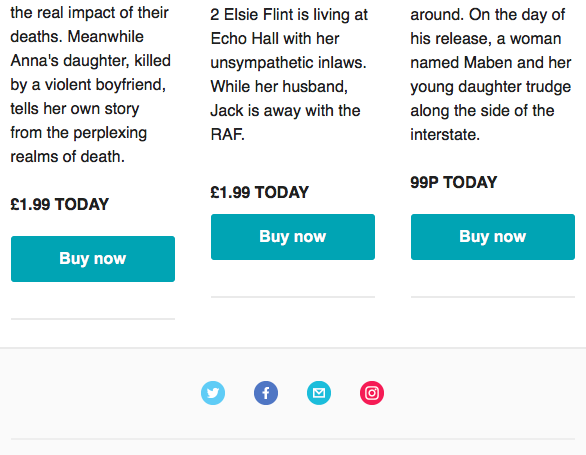 HarperCollins UK has a deals email called BookPerk which I launched in the UK, which works. - Use some of these techniques to build your lists. - Set up your own author newsletter - step-by-step guide here. - Collaborate with other authors - set up a deals email with all of your deals and encourage all of the authors involved to send to their newsletter lists. (By the way, I see a lot about authors sharing newsletter lists - this is illegal in the UK and everywhere else I suspect. If you are sending email lists around for others to use, STOP immediately. Only you can send emails to your newsletter list). - Collaborate with authors - Put 6 to 8 ebook deals on one author's website and encourage all of the authors involved to drive traffic to that page. Will work better if you all write in roughly the same genre, but not essential. (Do this regularly). If you'd like more BS-free book marketing tips, sign up to my FREE newsletter. 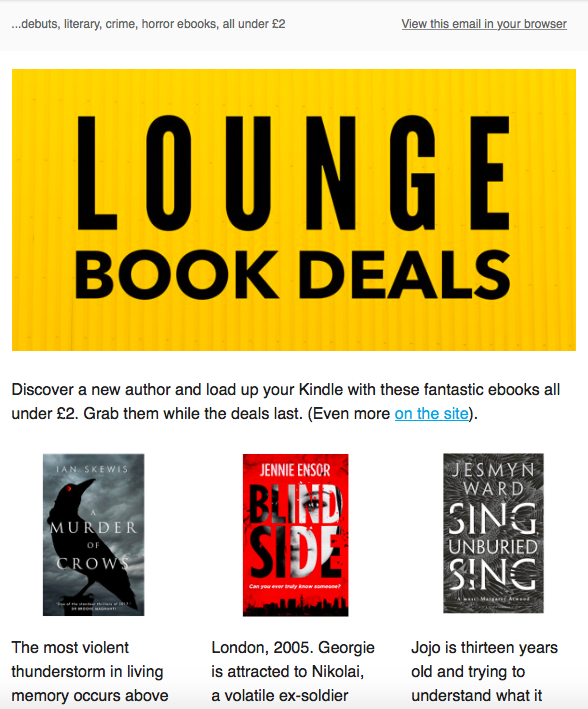 If you'd like a lovely books email in your inbox, then sign up to my Lounge Books newsletter. Do leave comments if you strongly agree or disagree with me. And do get in touch if you'd like to work with me in any way.